A few years ago I began growing Lima Beans (Phaseolus lunatus) in the garden when I scored some Violet’s Multicolored lima beans at a seed swap. 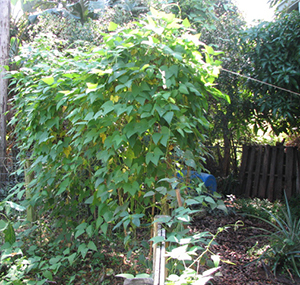 Lima beans will grow well in the hottest weather we have here in South Florida, and when they begin to yield, they will supply lots of very nice buttery lima beans, and they will thrive until the weather turns cold. The variety I most enjoy eating is the King of The Garden. It is a pole bean variety. It is an open pollinated heirloom so I can save seeds for my next crop, and the white beans are huge. I am careful not to grow any other Lima bean varieties at the same time so that when I save the seeds I am not accidentally making hybrid varieties. 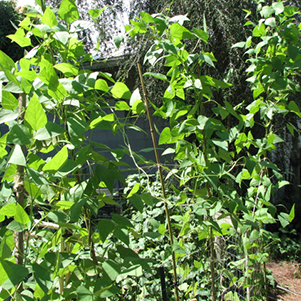 There are bush and pole varieties of lima beans. The pole varieties will go as high as there is support for them, and then they will lean over to whatever is nearby and grow to that. Be aware that however tall the support structure is for the pole bean, that is how high you will be reaching for your harvest. Also the plant will grow back and forth along the top of your support creating lots of weight up there. That can be disastrous for beans growing on a weak support on a windy day. I use bamboo poles and I have had to tie the bamboo to a support post to keep it upright. I really like lima beans because they are very hardy plants, and the beans are cased in a very thick walled pod that protects the beans from everything. 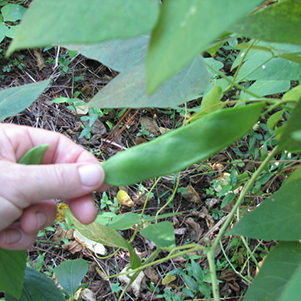 The pod will develop into a large size before the bean puts on any size, so it is a good idea to feel the bean before pulling it from the plant. If you are not certain, you can see through the pod by holding it up to the light until you become accustomed to the feel of a full size lima bean. I have discovered that lima beans are day length sensitive, so the plants I started in June, and the plants I started in August are both producing pods at the same time, so while Lima bean plants are glad to survive through the long summer days, they won’t feed you until the days are shorter. 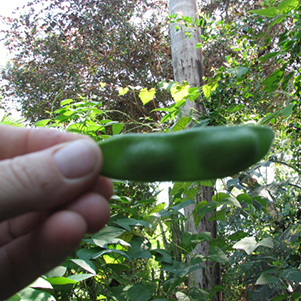 It is October, still hot and the lima pods are filling up quickly now. 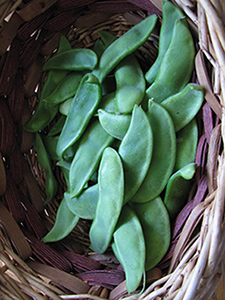 Lima beans can be cooked and eaten while they are fresh, or they can be dried for later use. They are not meant to be eaten raw however as they contain linamarin, a cyanogenic glycoside which when mixed with digestive enzymes creates hydrogen cyanide. Even a few lima beans eaten raw can cause some serious gastric distress. 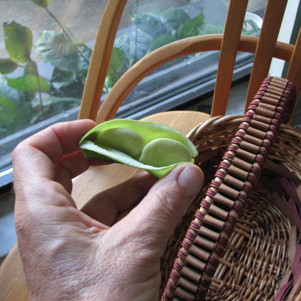 Cook fresh Limas in water to deactivate the toxins, and discard the cooking water. Dried lima beans should be soaked for at least 8 hours and then thoroughly rinsed, and then cooked in fresh water. 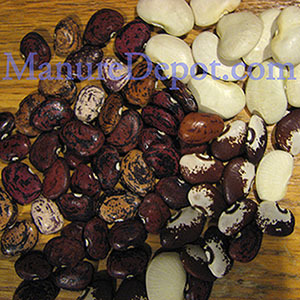 Some varieties of Lima beans have lower linamarin levels than others. Lima beans like other legumes have excellent beneficial effects on health and metabolism. They are fat free, rich in soluble fiber, and the carbohydrates digest slowly so they do not create spikes in blood sugar. They have positive effects on vascular and heart health, improving circulation, and lowering cholesterol, they help prevent heart attack and stroke. The amino acids and minerals in Lima beans have other beneficial health effects as well. As I learn more about the foods I grow and eat I am frequently stunned to find that these crops when properly grown (and properly prepared), are full of nutrients that have multiple beneficial effects on our health. It causes me to reflect on the true meaning of the Hypocrites quote “Let food by thy medicine.”. This above all else helps me to realize that I was made from this planet, and it is not only possible for us to be in sink with our beautiful blue/green earth, it is natural. Lima beans are wonderful (and underappreciated). But, don’t make lima bean and liver casserole (which a friend’s mom once concocted). Thanks for your comment Sara. In “sink” with something is a good expression, especially to do with nature. The spelling however is “sync”. Thank you for the edit Ashley, and thanks for reading to the end.